And the candidate we worked for in Maine, Janet Mills, won Governor! First woman elected to that post! Daisy extends its wins to the U.S.! Woot! 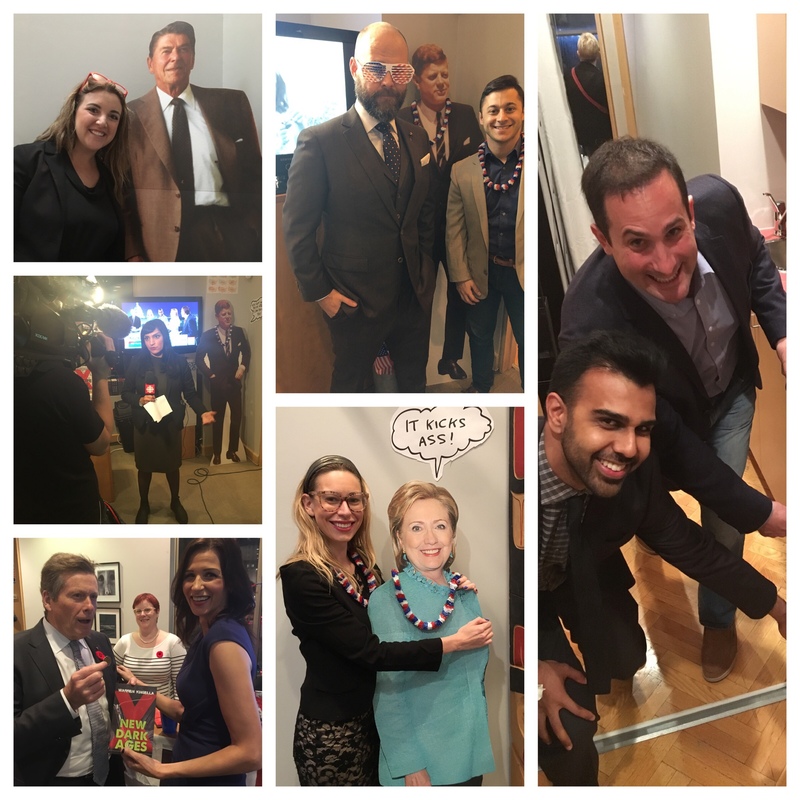 Logan Ross and the Gipper; Tom Henheffer and Zack Babins with JFK; Daisy alum Laksh Vig and Dion Angelini do yet more office fix-ups; Myriam Denis protects the real winner of 2016 presidential race; CBC TV broadcasts live from Daisy; and Toronto Mayor John Tory offers a toonie for my new book, New Dark Ages, while Lisa Kinsella and Katie Watson are amused. Minister of Immigration Ahmed Hussen accused Ontario Community and Social Services Minister Lisa MacLeod of “fear-mongering” and using newly arrived migrants to “demonize people”. MacLeod is sticking to her statistics: “Oct. 29, some 2,523 people – or 37.3 per cent of shelter occupants – self-identified as refugees” (G&M). Likewise, 6,943,276 Canadians voted for Justin Trudeau; if half of these personally adopted a migrant, 3,471,638 could be accommodated. Combined, 4,526,658 migrants could be easily absorbed into Canada over the next 5 years. The Canadian State must move to a war footing to combat xenophobia, Islamophobia and racism and assist the settlement of refugees. Operation Ghost House is of vital importance in this struggle.